Los Angeles and Paris are the only bidders for the 2024 Olympic Games after several cities, including Oslo, Rome, Budapest and Munich all withdrew their bid. 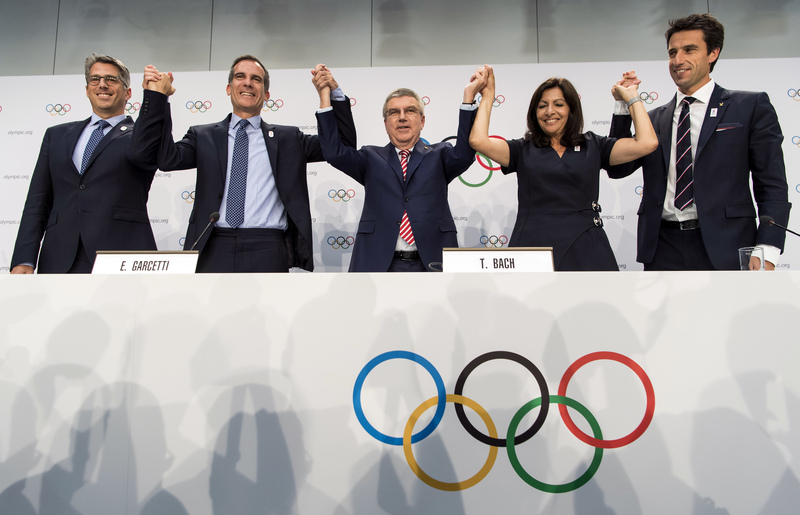 From left, Casey Wasserman, Chairman of Los Angeles 2024, Eric Garcetti, Mayor of Los Angeles, International Olympic Committee, IOC, President Thomas Bach, Anne Hidalgo, Mayor of Paris, Tony Estanguet, Co-president of Paris 2024, gesture, during a press conference after the International Olympic Committee (IOC) Extraordinary Session, at the SwissTech Convention Centre, in Lausanne, Switzerland, Tuesday, July 11, 2017. The International Olympic Committee (IOC) on Tuesday voted unanimously in support of awarding of 2024 and 2028 Olympic Games on the same occasion. All the 83 attending IOC members at the 130th IOC session voted for the decisions made by the IOC Executive Board in early June. Los Angeles and Paris are the only bidders for the 2024 Olympic Games after several cities, including Oslo, Rome, Budapest and Munich all withdrew their bid. Final hosts for the 2024 and 2028 games are to be decided by vote at the 131st IOC meeting in Lima, Peru, on Sept. 13. Though the very details on implementation of such a plan are yet to be finalized, IOC President Thomas Bach has already called the plan a "golden opportunity" for the future of the Olympic Movement, as it has ensured the stability of the games for the next 11 years. "Today we have built the foundation on which we are very confident that we can then build the win-win-win situation we are longing for," said Bach, referring the plan involving the two cities and the IOC for two Olympic games. He also admitted that the three parties will immediately begin their cooperation and coordination to the plan come true.